This travelogue is built in four posts — an introduction page and three parts covering three different regions of the city. Use the links below to navigate to the different pages. When one is asked to name cities in Austria, chances are three will pop out — Vienna, Salzburg, and Innsbruck. Each of those are significant tourist destinations due to their prominence and their scenery. That’s both good and bad — good for their tourist industries, bad for those who prefer smaller locations with less crowds, more elbow room, and more locals. It was for that reason that I decided to explore Linz, a city that is very popular with the locals but definitely not high on the international tourism scene. It resides in Upper Austria, where the famed Blue Danube River changes from a moderate river into a valley-cutter, becoming sufficient large to support double-length barges. 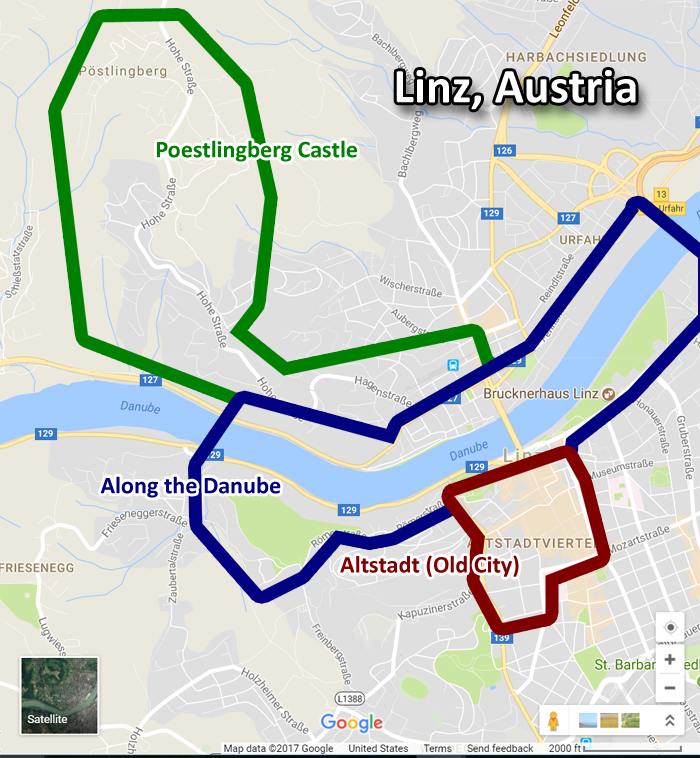 Linz is a major harbor city and provincial capital that resides on a major bend. But its downtown sparkles of that Austro-Hungarian flair that made Vienna and Salzburg such wonderful destinations. The interactive graphic at the bottom of the page shows a Google Map of the city with the general regions represented by the three pages included. Part 1 is of the old city or Altstadt, including the Linzer Schloss and its riverwalk and the various churches and shopping districts. Part 2 is titled Along the Danube, covering the riverfront on both banks to the west and east of the old city, including the beautiful green promenade. It also covers the city’s spring festival that I had the pleasure of visiting. Part 3 covers Poestlingberg Castle, including the long walk up the hill from the north bank of the Danube. Enjoy! And hum along with the famous “Blue Danube” waltz as you venture around. The map is based on a screen capture from Google Maps, (C) 2017 Google, with annotations done by me in Adobe Photoshop. Use the links below to access the individual posts.